Technique: Using a food processor allows for a finer dough texture. Taste: Serve the dumpling with a scoop of fat-free frozen yogurt or a dollop of light or fat-free whipped topping. Try: Any tart baking apple – such as Granny Smith, R.I. Greening or Northern Spy and select those that are firm and even-colored. Tip: Apples are naturally low in fat, sodium and contain phytochemicals (naturally occurring chemicals made by plants) that may reduce risk of some chronic diseases. Preparation: Preheat the oven to 350 degrees. Dough: Combine butter, honey, flours and oats in food processor. Pulse a few times until mixture looks like a fine meal. Add brandy or apple liquor and pulse a few more times until mixture starts to form a ball. Remove mixture from food processor, wrap tightly in plastic, refrigerate for two hours. 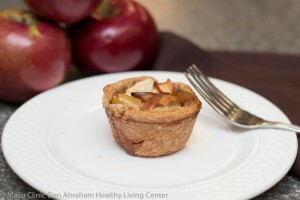 Apple filling: Mix apples, nutmeg and honey. Add lemon zest. Set aside. Roll out refrigerated dough with extra flour to ¼ inch thickness. Cut into 8 inch circles. Use an eight cup muffin tin and lightly coat the muffin tip with nonstick cooking spray. Lay a circle of dough over each lightly sprayed cup. Push the dough in gently. Fill the dough with apple mixture. Fold over sides and pinch at top to seal. Bake for 30 minutes at 350, until golden brown.